Yea! Finally a product review I am excited about and can endorse 100%! As a former preschool teacher and mother, I value finger paint! Sensory exploration, color mixing, tactile fun…what is not to love about fingerprinting? Artificial ingredients, chemicals, allergens, etc. Beyond declaring a product “non-toxic”, art supply manufacturers do not have to disclose their ingredients. This concerns me, especially when it comes to finger paints. What allures children to the experience of finger painting is their development inclination to explore the world in a tactile and sensory way (i.e. some of it will probably end up in their mouth). Even if finger paint does not reach the mouth, the skin absorbs anything applied to it,. They don’t call it finger painting because you don’t touch it! 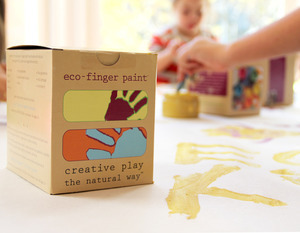 [amazon_link id=”B0037YH8YM” target=”_blank” ]Eco Kids Non-Toxic Natural Eco-Finger Paint [/amazon_link] lets your children get creative and messy without any worry about toxins or chemicals. Nothing like getting your hands on paint and kids love it! eco-paint™ is powder based, tactile and exploratory. It’s a feel thing, whether your using your fingers or a paintbrush, the possibilities are endless as it moves across the paper. A rainbow, crazy bug, or a self-portrait, eco-paint™ encourages the creative process. All natural ingredients mean peace of mind. It is available in a gluten-free formula. This product comes as powders you mix with water in a 1:1 ration. It mixes easily, and it is organic! You can also paint with it using a brush, if your child is like my son and does not like finger painting. Furthermore, the box is primed with soy ink and printed using certified wind power! No greenwashing here! « Do infant routines discourage breastfeeding?